Metal Cats: Make This a Series, Please? On May 12, Kristi and I went to powerHouse Arena in DUMBO, Brooklyn, to see Jo Nesbo in a Q-and-A promoting his new stand-alone novel The Son. 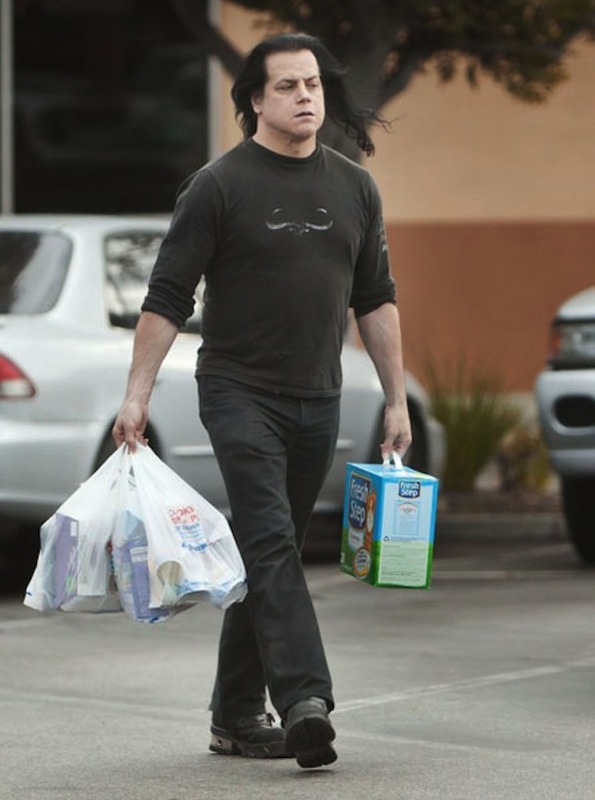 While waiting in line to buy our discounted copy of the book, we spied a plastic folder full of postcards featuring a metal guy with what looked like grumpy cat on his shoulder. On the back were all events for powerHouse during May, and it turns out that the bookstore has also launched its own publishing house. 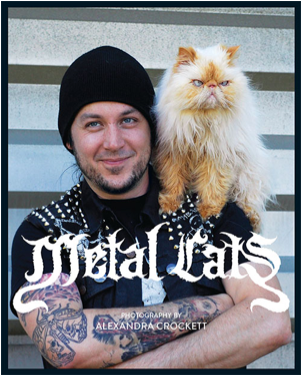 One of its first offerings is Metal Cats, a photo book of West Coast metal guys posing with their cats and kitties, who often resemble their owners looks- and personality-wise (as far as a photo can capture). There was a book launch later in the week with three metal bands performing, a raffle, and a chance to meet some of the guys who posed with their cats. We started out at Bushwick Country Club, where we thought we could have a few beers and warm up for the event. A fellow Taurus was having a birthday party on the back deck, and she had her guests wear pajamas. I got to see footie pajamas on adults, and when I made my way to the bar, there was a sign advertising Tecate with a tequila shot for six dollars. In other parts of the country that might seem expensive, but in New York that’s a hell of a deal. And very heavy metal. 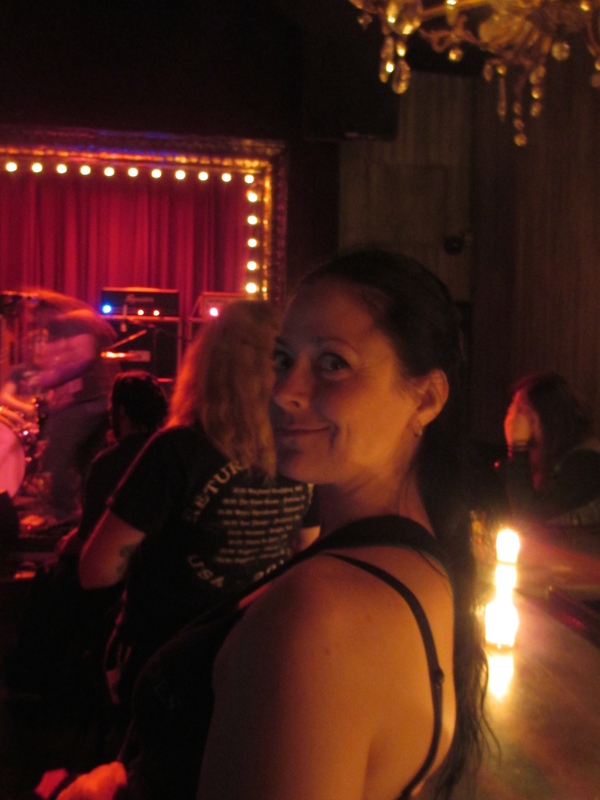 After girding ourselves with a few rounds of those and seeing a pair of Wonder Women arrive to the back deck birthday party (one a man), we headed to Union Pool, where the Metal Cats benefit was taking place. Kristi at Metal Cats benefit. We met the book’s photographer and editor Alexandra Crockett, picked up a few free pins, and looked at the book’s photographs. I love the Metal Cats photographs, but I really thought it was going to be a coffee table book with a thick, stiff binding that could take a lot of abuse. Instead, Metal Cats is a paperback slightly smaller than a composition notebook. Some of the pictures continue over a spread, and I’m afraid to open the book fully and crack its spine to look at them because then I might lose pages. And these are pictures that a metal person wants to study and absorb all of the details. I’m so intrigued by the metal lifestyle and found the background details of the photographs as interesting, or more so, than the subjects and their cats. I want to see the book titles on these metal guys’ bookshelves, I want to know exactly which Kiss posters are tacked up and papering the walls in their rooms, and I need to check and see if those are indeed matching potholders in the kitchen that appears in the background. I’ll probably be going over those photos later with a magnifying glass, like Guillermo del Toro used to with monster movie magazines, trying to figure out how filmmakers achieved certain special effects. My dream is that powerHouse Books turns Metal Cats into a series—preferably as calendars. 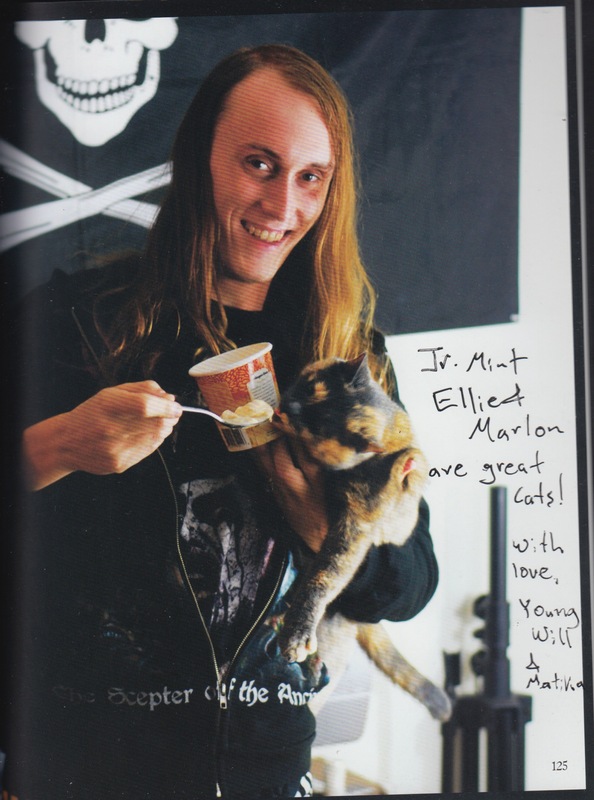 I want big, blown-up pictures of metalheads posing with their cats, so I can study and take in all the photo’s details for a full month. Right now my monthly calendar is a freebie from my grocery store, and I’m sick of seeing the same chicken recipe every day. It’s been some time since I’ve found a calendar I can live with month to month, and I’d gladly pay $12 or more for a yearly calendar of Metal Cats, especially since I know that a portion of the proceeds goes to no-kill shelters. 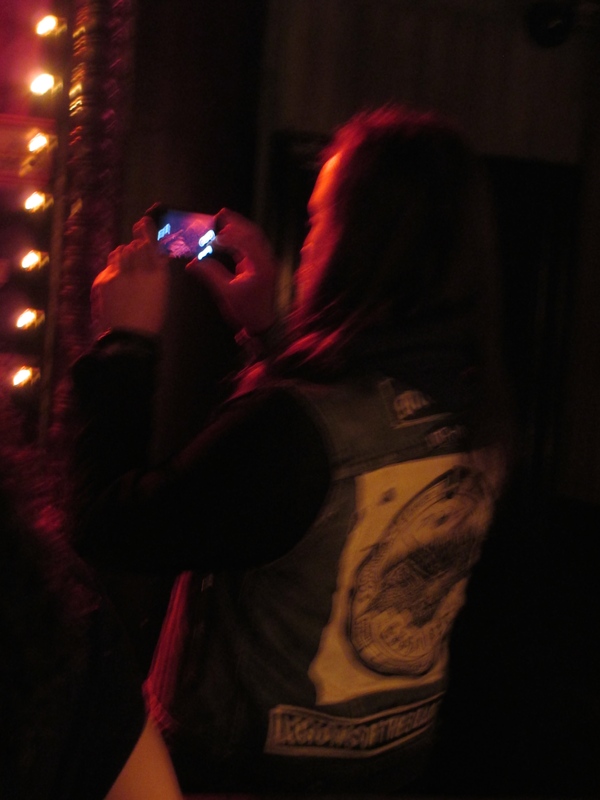 Metalhead at Metal Cats benefit. There was a $7 charge for the Metal Cats benefit show, but the money raised was dedicated to no-kill shelters, along with a portion that I paid for the book. I felt completely comfortable in the crowd watching the bands, knowing I was among metalheads who are also animal lovers. While paying for my copy of the book in the lobby area between shows, Young WillCheadle, one of the musicians featured in Metal Cats, came up and showed me where his picture was with Matika. Then he was kind enough to sign me and my sister’s book—addressed to our cats, of course. I read about the “Metal Cats” books before. I’d love to see the pics in the book. I saw the book at Barnes & Noble & definitely wish it were sturdier, it felt like a novelty book when I picked it up. Why Didn’t I Have This Book When I Was Growing Up?